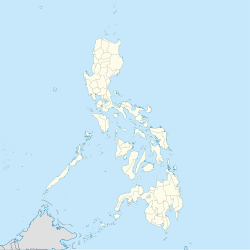 Sibulan, officially the Municipality of Sibulan, (Cebuano: Lungsod sa Sibulan; Tagalog: Bayan ng Sibulan), is a 2nd class municipality in the province of Negros Oriental, Philippines. According to the 2015 census, it has a population of 59,455 people. Sibulan is bordered to the south by the provincial capital of Dumaguete City. It is the location of the Dumaguete Airport, the main airport for Negros Oriental. Sibulan is politically subdivided into 15 barangays. Sibulan has six coastal barangays: from north to south they are Ajong, Looc, Poblacion, Cangmating, Maslog, Agan-an and Boloc-boloc. The provincial airport, known as the Dumaguete Airport, is actually in Agan-an, Sibulan. There is a growing number of guest houses and beach resorts from Cangmating southward to Dumaguete and the coral reefs of Ajong are attracting more dive boats. The municipal seat is in barangay Poblacion, approximately midway along the coast of the town. The main municipal port facility is in Poblacion, where a fast ferry runs every hour to Santander on the tip of Cebu island. There is also a fishing and freight port in barangay Looc. Sibulan has two small Marine Protected Areas (MPAs), which are coral reef areas that prohibit fishing, swimming and diving. One is in Agan-an, just north of the airport, the other is in Cangmating. These were established to improve the sustainability of the local fishery. The inland barangays are primarily agricultural and residential with minimal business and public facilities. Most commercial development is along the national highway, which runs the length of the town from Dumaguete in the south to San Jose at the north. Most business and light industry is along the highway in Boloc-Boloc, Maslog, Agan-an and Poblacion. This is largely urban sprawl from Dumaguete seeking the advantageous tax rates in Sibulan. Sibulan also boasts a golf course resort, perched on the foothills in barangay San Antonio, just north of the town center. ^ a b "dumaguete.com". Retrieved Sep 30, 2014. Wikimedia Commons has media related to Sibulan, Negros Oriental. The travel guide Wikivoyage includes Sibulan in its Dumaguete article. This page was last edited on 24 February 2019, at 10:44 (UTC).